Friends, I’m going to be bold and give you my opinion about something chicken-ish. Ready? Here goes: I think it’s perfectly okay if you don’t free range your chickens. 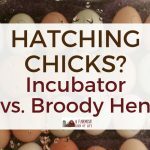 When I first became a chicken mama m-a-n-y years ago, before everyone and their brother was on Facebook, there was an overriding belief across online forums and chat rooms about chicken mamas who free ranged their chickens. 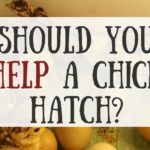 No one really came out and said it (ok, some people did) but you could feel it hanging on the breath of our conversations: chicken keepers who free range their birds are more awesome than chicken keepers who do not. And honestly, I bought into that for awhile. I was probably caught up in some sort of crunchy backyard chicken elitism, but all I could think about was the day I’d be able to let my own chickens out to free range. Why? Because then I’d be doing a proper job of raising my precious chickens. Yes, then I would be awesome. I’d get a free-ranging chicken keeper crown and sash and entry to an exclusive club. I would know that I was doing better things than all those people who (gasp) just let their chickens out into a (gasp) run. But we don’t free range our chickens anymore. And I’m here to tell you that not free ranging your chickens is completely and totally okay. I admit, I really enjoyed seeing our chickens out and about in the yard. It was sorta Norman Rockwellish. But a big thing I didn’t enjoy? Watching dogs or fox or eagles come into the yard and haul my chickens (or their chicks) off. 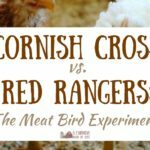 With free range chickens, there were other things to deal with as well—some of them minor annoyances, other things that became major annoyances when all snowballed together. I mean, you do realize that wherever a chicken goes—anywhere on your property, or your neighbor’s—they leave little white and green blobs of evidence that they’ve been there? What do you mean you don’t free range your chickens? When I’m in this conversation, there’s usually a sort of pause and then a silence after my answer. It’s almost like they don’t know what to do with that information. Because people assume since I’m that farm(ish) girl with that one blog, that I’m raising my chickens correctly (read: free ranging them). I mean, real chicken mamas free range their chickens, right? It probably says that somewhere on a t-shirt or a bumper sticker. That’s sort of a lot to fit on a shirt, though. But if you don’t free range your chickens, you’re being cruel…right? Cruel is keeping 100 chickens in the space that is meant to comfortably keep 10 chickens. Cruel is forgetting to feed your chickens. Cruel is leaving them without clean water. Cruel is kicking your chicken around like a football. But choosing not to give your chickens roam of your property? That doesn’t mean you’re cruel. At this time, my chickens do not have roam of our farm…. …and my chickens are happy. I spend time hanging out with my chickens. I bring them treats. I built them a fodder system, and I bring them green yums every day. I talk to them and sing them pretty songs. Ask them. They’ve got a large, lovely covered outdoor pen which protects them from jerk-face dogs, hungry eagles, and sneaky fox. Our contract is that I keep them safe and happy and they lay me eggs. We’ve all signed on the dotted line in agreement. I don’t free range my chickens. And I’m okay with that. You guys, it’s not cruel or mean or horrible to choose not to free range. What’s cruel and mean and horrible is maybe spending all this time judging each other’s chicken raising, instead of celebrating the fact that we’re able to have chickens at all. 2. They become so bold they are now trying to come into the house to eat the cat food. 3. I can’t find the eggs! The coop became so insignificant to them, they just lay everywhere. Very annoying. I am working on a new coop. Once this is done I think that I will let them free range only a few hours a day. Sharing your post on social media. Thank you! Gosh! People are judgmental. Between dogs, hawks, raccoons, opossums and skunks, we can’t free range our chickens either. Some folks need to get over it. And the bottom of my shoes stay clean when I go in the yard. I have been keeping chickens for 9 years and always free ranged them. This year I made two major changes. First, I chose to go with all bantams. Second, I converted our 60 yr. old *well house into a chicken abode and fenced in a 10 by 20 foot yard for them just outside the door. Why the big shift? I lost 9 hens in a span of 9 days this summer to a fox(es)! It was heartbreaking! Our summer was stifling this year and the girls refused to roost in the chicken tractor. I went out dutifully to round them up each night, but the property provides to many hiding places. However that doesn’t stop a fox now does it? I have Betty left out of 10 chickens now. I love chickens and I like variety so I decided to go with bantams and can keep them safe in a much smaller space. They are happy and I am now stress free. As a neighbor (we have lived here over 20 years) of someone that insists on free ranging…I.e. letting the crapping feather dusters poop all in MY yard (neighbors moved in 5 years ago). Let me make this VERY CLEAR. No matter how nice your neighbors are they will NEVER be happy you allow your chickens to poop all over the place. If I save one persons sanity with this post I will feel I have done something great. Yes yes yes. A million times yes! We have three cleared acres and a large section of woods that our hens used to enjoy. Thankfully, predators were never really an issue for us but the poop is a different story. Oh, God. So much poop poop. It got to the point where my toddler said we couldn’t have his birthday party here because of the chicken poop. That was my breaking point. And this was with only dozen hens. Anything more would have driven me mad. Much as they’d love it, I don’t free range my 17 hens either. The main reason is that there are too many hawks around. I hear them screaming every day. So unfortunately that precludes even a large open pen/fenced-in pasture. Even though our entire property is fenced in. A strong fence works fine to keep dogs out, and if electrified will keep out racoons, etc. as well, but aerial attacks are impossible to prevent in a free-range situation. I’d rather have fewer birds and house them secure from predators and with plenty of space per bird than a larger number and lose them to predators. Hawks and dogs are the absolute worst and unfortunately there are a lot of both around. Thank you for the article and all the comments! We started letting our “girls” free range for an hour or two in the afternoon a couple days a week. I would take a book and glass of wine and a lawn chair and let them forage while I read. They were happy and so was I … until they got wise and it was a hassle to get them back in the coop. So we have been wracking our brains trying to come up with a chicken tractor so they can free range and be moved around and it would help our garden too.. We only have 8 hens, and their pen is 10’x12′ and the roof is about 8′ high. I feel like they are bored, and we even have a new rivalry going on (which I’m sure is normal). Add to that, we have a large screech owl and a couple of young hawks that have been hanging out around our property for a while now. So, I can rest a little easier now knowing I’m not being cruel. I’m happy to hear that. However we have a couple of hens that are bullies and I feel like they’re bored. We have 8 hens and their coop is 10×12. Thank you for this article! I have six hens that we raised from chicks. This is our first experience with chickens. We love our girls very much. My husband built a good size coop and run for them. They get the best organic feed, lots of treats and I change their water twice a day. We let them free range when we can keep a very close eye on them. I was feeling like somehow I was letting them down by not free ranging all the time and was thinking of rehoming them to a farm where they could. You have saved me with this article ! Thank you and my girls thank you!